Every Texan knows all too well the struggle of protecting one's skin from the South's scorching sun. It is this struggle that led San Antonio native Emily Bolf to create a skincare brand rooted in natural ingredients with an aim to salvage what the sun has damaged. With the beauty industry exploding right now, it can be difficult to determine which products are beneficial and which are mediocre. A foolproof way to figure this out is by going back to the basics and looking at a product's ingredients. Forget fancy packaging, celebrity endorsements and aesthetics, at the end of the day, what really counts is what is sinking into your skin. Enter Kelia, a skincare brand based in Austin, where products revolve around one superstar ingredient - Kigelia Africana. "The idea for Kelia came from a trip I took to Namibia several years ago," shared founder Emily Bolf. "Just by chance, I asked my guide about something he was putting on his face and he told me about Kigelia Africana extract (also known as the sausage tree in Africa). He was having remarkable success treating some skin cancers on his face with it." Prior to Bolf's journey into the skincare industry, she studied Journalism and Photojournalism at the University of Texas at Austin and has since been working as a producer and digital director for Austin City Limits. Bolf credits her creative background as being helpful in the process of creating Kelia. "Having these skills really helped me build my brand - I was able to art direct the project, shoot photographs, build the website and I still continue to execute my digital and social media marketing," she said. Having seen the effects of Kigelia Africana firsthand, Bolf was quick to look for this skin solution in the States. Seeing a lack of it in the American beauty market, however, motivated Bolf to bring Kelia into existence and take a crash course in skincare and cosmetics. "My mom had had a number of skin cancers removed from her face and was really suffering from chemo cream she had to use, so I really wanted to get some Kigelia for her to try," she recounted. "I started thinking about developing a clean skincare line that could address sun damage using Kigelia as the signature active botanical ingredient." 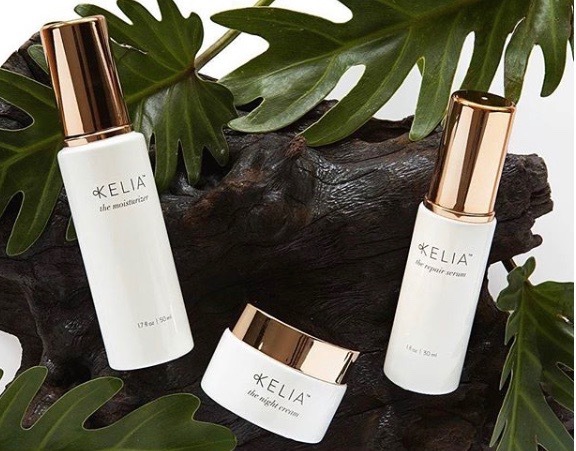 It's clear that the key ingredient in Kelia products is Kigelia, but it is also the combined use of other botanical ingredients that make these products stand out. "Kelia products have been formulated to specifically address visible signs of UV and sun damage, which unfortunately almost everyone has. Kigelia has shown to be soothing and anti-inflammatory, it's packed with a unique, powerful combination of antioxidants and has been shown to firm and lift the skin," explained Bolf. "When combined with some of our other supporting botanicals, it helps brighten and lift dark spots as well." While Kelia products are best suited for normal to dry and more mature skin, Bolf reassures that anyone can use them and see benefits with continued use. A look at the customer reviews on the Kelia website confirms this, as many have shared how the natural products have worked for them. "Some aestheticians are using The Repair Serum to soothe the skin after intensive treatments such as needling and I've also heard from people who have stopped breaking out once they've started using The Repair Serum," shared Bolf. "This serum is oil-free and is a light, quick absorbing gel texture, so it can easily be used under any additional serums or lotions that someone might be currently using." With the brands' origins rooted in Africa, Bolf shared her interest in giving back to a developing community and having a social impact on the place that inspired her skincare line in the first place. "My goal with Kelia is to eventually establish closer relationships with the people in Africa who farm Kigelia and buy directly from them, to ensure that the benefits are going directly to their communities and that the whole operation is completely sustainable," she said. "Until that happens, research has shown that just by increasing the trade of Kigelia, more money is being infused into these communities and creating much-needed supplemental income there." Fueled by a meaningful purpose and a motivated entrepreneur, the future of Kelia points to a bright future and even brighter skin. "We have several more products in development, including some with SPF, and would like to launch those as soon as possible," shared Bolf. "I'd love to see my goal of working more closely with people in Africa come to fruition and I'd love for more people to try Kelia and learn what Kigelia Africana can do for their skin."